Last month, I criticized city government for micromanaging private property. The city Planning Department had expressed reservations about the look of the proposed CVS for 14th and College in downtown Bloomington. Right now, the lot where CVS wants to build is a vacant lot. A building that once housed a Burger King sits there, and has been closed for a while. Now, the building is covered with graffiti and is a blight on the area despite being prime real estate. 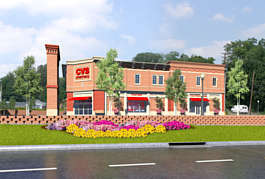 Along comes CVS with a plan to build a new store on the property, erasing the blight. One would think the City Council would be happy with this turn of events and would be encouraging CVS to build, right? Right? The January 3 City Council meeting, as described by the Herald-Times, was a debacle. The City Council arrogantly sat in judgment of the proposed store. Andy Ruff (D, at-large) criticized the plan to set the store in the middle of the lot, where it would be surrounded by parking. Would it be better for the lot to remain the blight it is now? Tim Mayer (D, at-large)wanted the retaining wall to be built using a different material, while Chris Sturbaum (D, 1st) and David Rollo (D, 4th) expressed concern over the fact that limestone is absent from the design. CVS explained that limestone would be too expensive. The fact that CVS had to even answer this question is ridiculous and shows that city government goes way too far in micromanaging private property. Is it any wonder why Bloomington has a reputation of being anti-business? As Sabbagh said, the City Council's duty is to set land-use policy, not to micromanage the way buildings in this city are designed. This is not a state-run economy, and members of the City Council (despite what some of them might think) are not more qualified to design a pharmacy than professional architects employed by a national chain that has built stores all over this country. Do we really want these nine people deciding how every building in this city looks? For Chris Sturbaum, the answer is apparently yes. After city attorney Dan Sherman informed the council that "they can only grant or deny a petition to vacate alleys, not impose design conditions as part of it", Sturbaum said he wanted that checked out. That statement should be a major concern to every property owner in this city. I am glad CVS is moving forward with this much-needed project, but I would not blame CVS one bit if they just threw up their hands and gave up on the idea of relocating the North College store closer to downtown. When a business is met with this kind of arrogance in response to a proposal to revitalize a blighted area, it should make the voters of this city sit up and take notice. City elections are only one year away. Hopefully we can make some changes and send a message to the city council that they are elected to represent us, not rule us.